Brooklyn has always been a large melting pot of different cultures. From the Russians at Brighton Beach to the exciting Caribbean flavors of Flatbush. From Kosher tours to Hipster Hangouts. We explore all of these seeking out the most authentic foods and shops for an eye opening adventure. Here are some of the tours you can enjoy with Noshwalks in Brooklyn. Also, don't forget about our other tours in The Bronx, Manhattan, Queens, Staten Island, and parts of New Jersey. Visit our Walking Tour Schedule to see which tours interest you the most! 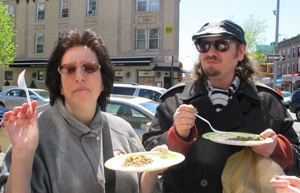 Sign up for one of our public food walking tours of Brooklyn, or call to schedule a custom tour for your group outing. This tour covers a famous block of Atlantic Avenue renown for its great Middle Eastern markets and Eateries. This block was known in the 1930s as “Little Syria,” as it was packed with shops owned by families that had originally established outposts in a lower Manhattan area known as Washington Market. When the Washington Market was demolished to build the Brooklyn Battery Tunnel, these families relocated their businesses to downtown Brooklyn, which was then a short ferry ride from lower Manhattan. Although many of the families now live in Bay Ridge, their markets continue to thrive and, as in the case of Sahadis, become more international in scope. At present, this tour is combined with a visit to the Latin American area of Sunset Park, Brooklyn, where we take food bought in both neighborhoods to Sunset Park itself for a picnic. Mother-daughter team of Helena Bakke and Arlene Rutuelo offer the best homestyle Norwegian specialties as well as a top selection of Scandinavian imports at their Bay Ridge store Nordic Delicacies, which sells nationwide through a catalog and Web site. Known for its Scandinavian seafaring tradition, Bay Ridge is now a truly multi-ethnic community filled with culinary treasures. 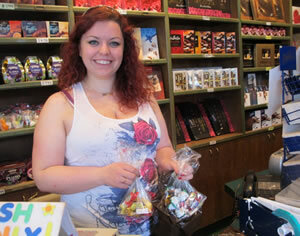 Markets or bakeries we’ll visit include Norwegian, Italian, Moroccan, Danish, Turkish, French & Lebanese. We’ll examine the contrasts between the older immigrant communities and the newcomers, and sample some of the more unuusal foods you’ll find in season – for instance, fresh garbanzos or fresh almonds, which are nothing like the usual version! An extended tour can include a walk through some of Bay Ridge’s leafy masnion areas and a visit to its Botanical Garden. The gardens are included on the map. Although 18th Avenue, the main boulevard of Bensonhurst, is known as Cristofor Colombo Boulevard, this neighborhood is no longer as densely Italian as it once was, and this tour has evolved to include more of Bensonhurst current rich cultural mix, including Turkish, Polish, Russian, & Chinese markets & bakeries, a well as an Italian café, where the tour begins, and a well-known Italian cheese maker. Have a Vietnamese avocado milkshake and Turkish appetizers or kebabs at the end! Memorialized by Neil Simon in his autobiographical play, Brighton Beach offers the best of New York by combining delicious food and a spectacular view of the Atlantic Ocean. Coney Island is within walking distance, so you can head there after the tour. (The famous Cyclone and Parachute jump are visible from the Boardwalk.) Come on an empty stomach as we savor Ukrainian, Russian, Georgian, Uzbek, Turkish and other foods and flavors in this amazing neighborhood. Includes Brighton Beach Avenue and the Boardwalk. Starting in 2014, this tour now begins in Sheepshead Bay and includes several savory stops and a picturesque stroll before we head on to Brighton Beach. This tour, introduced in 2010, combines a celebration of the culinary delights of Guyana, Trinidad, and Jamaica (and possibly Haiti and Barbados) with an exploration of the history and architectural delights of this busy area of Prospect-Lefferts and Flatbush, Brooklyn. Located near the southwest corner of Prospect Park, we head down Flatbush Avenue and along Church Avenue, weaving our way into markets and eateries, sampling Caribbean "finger foods" (various types of patties and Indo-Caribbean appetizers), Jamaican style ice cream, roti, doubles, curried vegetables, ginger beer and more. We'll visit the indoor Caton-Flatbush market, fascinating incubator of small businesses. A highlight of this tour is a visit to a "backyard" restaurant that will make you think you're in Jamaica! While tasting, we also see and discuss a number of historic sites in the area, including Erasmus Hall High School, the Flatbush Reformed Church (dating to the 17th century), an historic pair of streets with British-style homes that include some of the first driveways for private cars in NYC, and more... If done on a Sunday as a longer tour, this Noshwalk can include a visit to the Chassidic area of Crown Heights. Our annual Dyker Heights tour takes place in the evening a few days before Christmas, so that we can combine a visit to the unique (and way-over-the-top) holiday decorations of the neighborhood with gourmet treats at a fabulous café and various appetizers at one of Dyker Heights’ best pizzerias. This tour, usually offered as a Friday summer tour, includes a visit to the famous ACME smoked fish factory (open to retail customers Fridays only) as well as markets, where we’ll taste kielbasa, pierogi, fruit soup and other specialties n this mainly Polish area. We’ll conclude (after Acme) with a wonderful lunch. Bring a freezer bag! You’ll revel in this area’s ethnic and architectural diversity! Food stops include Chinese, Turkish and Mexican markets, bubble tea and Chinese ice cream; Thai basil seed drink; the cheapest espresso in NYC and more! Weather permitting, the tour concludes with a picnic in Sunset Park. This tour is scheduled several weeks before Passover, so that we can include visits to two shmura matzoh factory as well as sample the various kosher specialties in the area. We meet at Borough Park’s largest Jewish bookstore, where you’ll have time to browse before we start walking. Although this area is most commonly associated with Polish and Hungarian Chasidim, it also has several kosher Uzbek restaurants and an Uzbek bakery. We’ll visit some of this neighborhood’s Syrian and Israeli style bakeries and markets, plus local Sephardic landmarks and its lovely residential area. In the past we’ve visited two synagogues and expect to do the same this time around. With more time, we’ll one of Brooklyn’s newest kosher supermarkets, sometimes referred to as the kosher “Whole Foods.” A great book to read for background on this neighborhood is Lucette Lagnado’s memoir “The Man in the White Sharkskin Suit.” She was born and raised in Cairo’s affluent Egyptian community (many of whose members had roots in the Syrian Jewish community) but joined the exodus of families from Egypt that eventually settled in Brooklyn. This tour highlights the kosher bakeries & markets of Chasidic Williamsburg, Brooklyn, which combines traditional Jewish cookery with contemporary food adaptations. The tour combines history & architectural insights with delicious food. We often create a mini-picnic in a local playground with a selection of great appetizers, challah and other bread, and fresh fruit. Later, we’ll have kugel and blintzes!